Back to the recipe, the original recipe is from the book “Extreme Brewing” written by the founder of Dogfish Head Sam Calagione. I was quite fascinated about the recipe and so I went for it. I have to mention that I haven’t tried the original Raison d’être yet. It is nearly impossible to get any of the Dogfish Head beers here in Europe. So I can’t tell if this is a real clone recipe or not. And I had to do some changes to apply the recipe for European ingredients and lowered the original gravity as well. 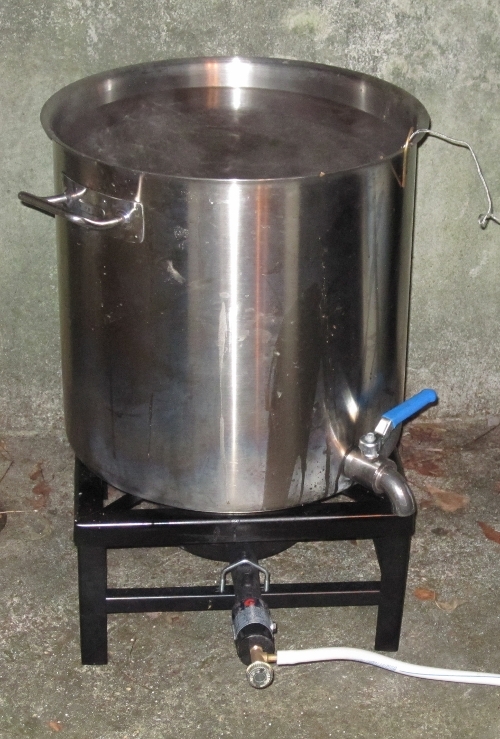 01/02/2011: Brew day. The first in 2011. Just me and my brewing equipment. This was my first full size batch of 42 L. My kettle can hold about 50 L (13.2 gal). Started to mash-in and already had to pull out about 5 L as the kettle was already full with 45 L of mash water and nearly 10 kg of malts. Put the 5 L back after resting at 55°C (131°F). Sparged and started to boil the wort. No measurements. Added the hops and candy sugar according to the recipe. The raisins were first puréed in 1 L of hot wort and then added to the boil. Then chilled after a whirlpool to approximately 22°C (72°F) and bottled the left wort from the kettle for priming. OG of about 15.6°P, nearly one Plato higher than expected. Then added two Activator packages to the wort and let it ferment at 20°C (68°F). 01/15/2011: Racked the beer and bottled it with the priming wort. I determined the yeast concentration in the beer with a counting chamber to ensure a proper carbonating process in the bottles. The concentration was about 4 E6 cells in one mL. 1 E6 cells mL-1 are enough for a proper carbonation so there was enough yeast left in the beer. Left the beer for nearly three weeks at 16°C (61°F) for conditioning and storage. Calculations: OG 15.6°P, TG 2.6°P gives a ABV of 7.1% and an attenuation of 83%. Wyeast states an attenuation of about 72- 76% for the #3522 Belgian Ardennes. Aroma: Spicy and hints of banana. No hops and malt detectable. Hint of sweetness and some dark fruits. Very nice aroma. Kind of a wine taste too. Appearance: Copper, clear, nice bubbles and the head is just awesome: creamy, frothy and very persistent. Flavor: The feast begins: First comes a spicy, peppery and light phenolic note in front. Then some banana. Pretty dry. No alcohol detectable on the palate. Mouthfeel: Medium body, lively carbonation and medium lasting and light sweet aftertaste. Light warming sensation from the alcohol in the throat. Overall Impression: Wow! 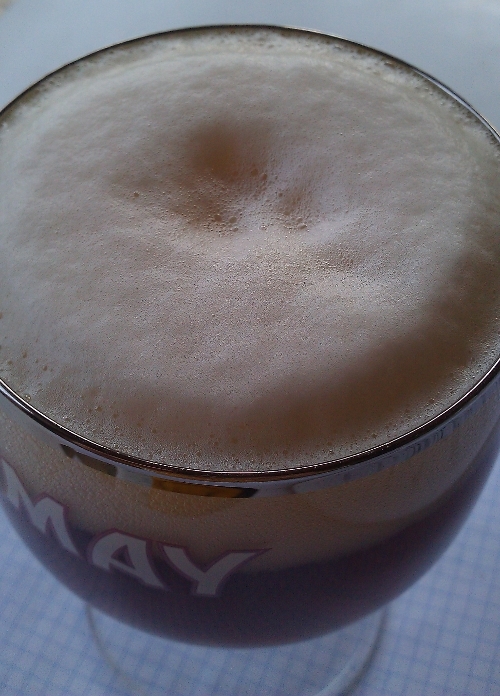 Pretty neat Belgian beer with a fascinating head on top. No off flavors. The raisins give this brew a very own note. Would I drink a second one? Definitely. Maybe increase the ABV for a next batch? The only thing that bugs me is the banana flavor. Did some research and found out that the #3522 produces some banana character when the fermentation temperature is a bit higher. This is of no surprise to me because the most Belgian yeasts are very similar to wheat yeasts: The wheat yeast character from the Belgian yeasts increase when the fermentation temperatures are a bit higher. I would therefore lower the fermentation temperature to prevent the banana flavor. Aroma: Spicy. No hops and malt detectable. Some sweet notes. Less character than a year ago. 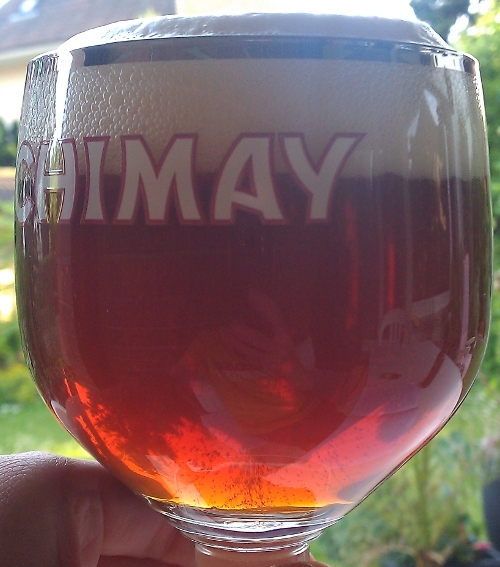 Appearance: Copper, nice bubbles, clear and still a creamy and very persistent head. Still looks the same. Flavor: Spicy and some phenolic notes. Dry. A hint of alcohol detectable on the palate (burning sensation). Complexity decreased with age. Mouthfeel: Medium body, lively carbonation medium lasting and light sweet aftertaste. Light warming sensation from the alcohol in the throat. Overall Impression: The character of the beer is still very similar to the fresh one. But the banana notes are gone. And it tastes a bit old and less complex. Meaning that the complexity of the flavors is less than a year ago. But still a very tasty beer indeed. Will taste the beer in another year again. So, what did I learn from this batch? First, I am able to brew a full batch size of nearly 42 L (11 gal) with just minor problems. Thats cool in my opinion, right? Second, the recipe turned out the way I expected it to taste like (except the banana notes). I recommend to lower the fermentation temperature to get rid of the banana flavor. It is kind of a off flavor to me in this kind of beer. But if you like a banana character in your beer, feel free to increase the fermentation temperature. The raisins gave this brew a very own note of its own. They definitely belong into this batch. I can’t imagine how it would taste like if there were no raisins in there. But I could not taste any of the candy sugar characteristics at all. Please let me know if some of you out there tried this recipe and tell me your impressions. 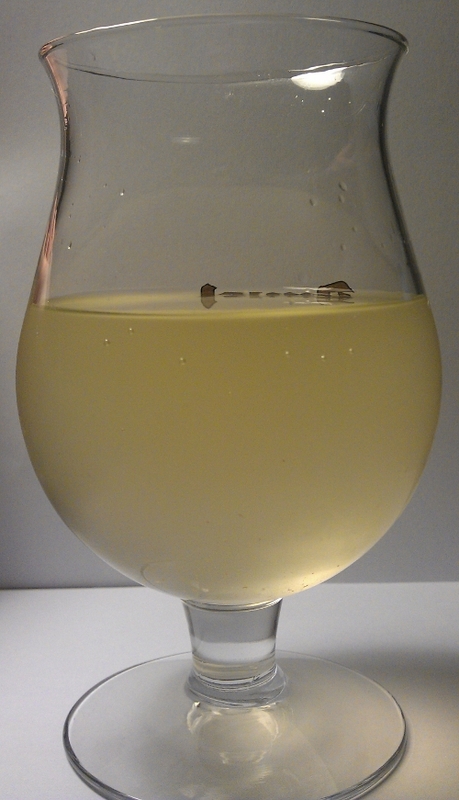 Eureka, my first water kefir is ready for tasting. 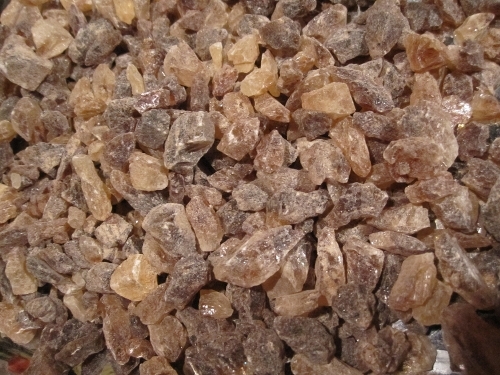 This recipe consisted of: sugar, raisins, water and a water kefir culture. And some lemon juice. I bottled the kefir after fermenting for two days and left it outdoors to keep it cool (it is winter in Switzerland). Aroma: Smells sweet and some notes of raisins. No sourness detectable. Appearance: Straw yellow, hazy and some bubbles. No head. Some particles are floating in the liquid. Flavor: First notes are raisins, some sweetness and a very light hint of sourness. Pretty dry aftertaste. Nice prickling on the palate. Mouthfeel: Light body and some carbonation. Sweet aftertaste. A real thirst quencher. Overall impression: This kefir reminds me of a champagne made with raisins. It has Cider notes as well but no apple character. To summarize: it tastes very subtle, only the raisins get through and are very easy to detect.The appearance, well, looks kind of a very cold white wine. The sour sensation might come from the light carbonation of the kefir itself or from the lemon juice. So, this was my first kefir. I am very fascinated about the character it has. But I would love to get it more sour. I guess two days are not enough to get it sour. The pamphlet, which came with the kefir culture, suggests two days of fermentation to get the best results flavor-wise. I will let it ferment for maybe four days next time and look what happens. This was a very cool experiment. I already made my second batch with dried apricots instead of raisins. And I will let it ferment for four days instead of two. I might post the tasting notes of the second batch but since this page is not really about kefir… I might leave it with this post about kefir. But I definitely will do further experiments with my kefir bugs. And I will do a Berliner Weisse some times with the kefir culture or at least with some of the bugs from the kefir. Eureka, time for another recipe from the past. Today my interpretation of the House Pale Ale from the Homebrewtalk forum. The recipe gives rise to a malty and Cascade hop pronounced beer. Lets get into the recipe. 04/22/11: Brew day. Iodine test was negative after mashing one hour at 66°C. 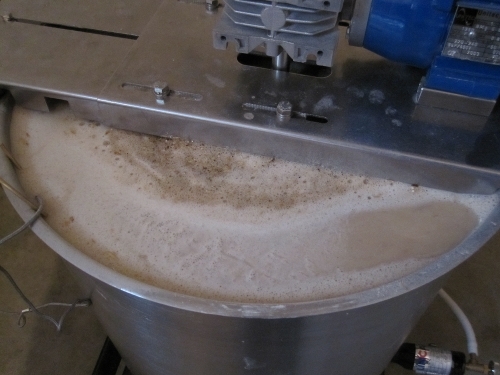 Then heated up to 78°C and transfered for sparging. After collecting the wort, I heated the wort up to a boil and added the hops according to the recipe. After boiling for one hour, I stirred the wort to get the hops and protein debris to the center of the kettle and cooled the wort down to 20°C and added the Nottingham dry yeast. 05/01/11: Transferred the beer into a keg and force carbonated it and let it mature for about three weeks in my kegerator. This was my first beer that went into a keg. Aroma: Citrus, malty, spicy, very nice. Appearance: Yellow color, light haze (maybe yeast? ), some carbonation visible, no head. The lack of head might be due to the very low carbonation. Flavor: Very malty character in the front and some Cascade spice and citrus flavors. Mouthfeel: Medium body, low carbonation, medium lasting malty aftertaste, balance is more on the sweet than bitter site. Overall impression: First of all, the beer is flawless in my opinion. And fresh. It is a very easy enjoyable brew. One thing that I did not like was the malty character. In my opinion a bit too overpowering. Maybe substitute the Vienna malt with a Pale malt to decrease the maltiness and maybe dry hops to increase the hop aroma. Eureka, time for another post about a cool project. 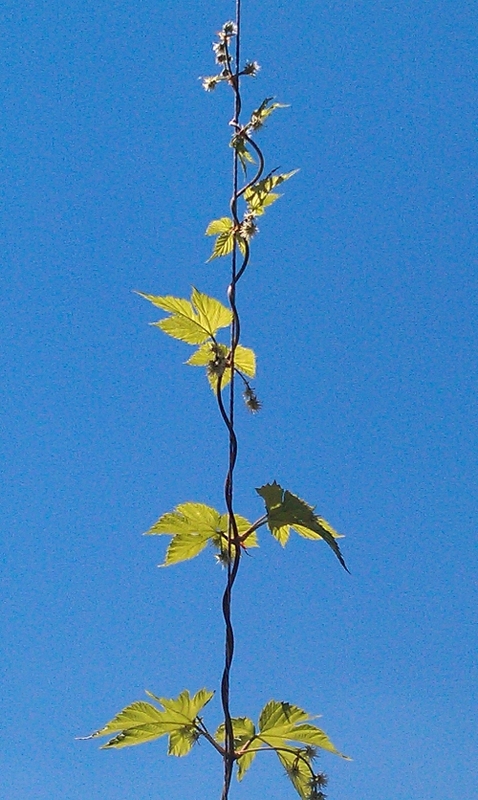 Today, growing your own hops in the garden. As I am a very interested in gardening as well (like carnivorous plants and such), I purchased a Northern Brewer and a Hallertauer Mittelfrüh hop plant from Germany. After they arrived, I planted them into big buckets and installed a kind of climbing aid for the plants. I used normal strings for that. The hop harvest 2011 begun. After some watering and caring, the plants begun to grow. In addition to the two plants, I purchased a Cascade rhizome and planted it right after I got it. But I could not see any growth after all. The rhizome is still in the soil and will try to get it to grow this year. I have to mention that I purchased the rhizome late in the season… But the hop season 2012 is near to begin and I’ll buy myself another Cascade plant for sure. Maybe some other cool variety like Centennial or East Kent Golding? I hop(e) that I can brew my first harvest ale in 2012 with freshly harvested hops. That would be awesome. 06/17/06: Brew day, nothing special happened. Fermentation started after two hours. 06/21/06: Bottled after four days! I wanted to try the method where you bottle just at the point where there is enough sugar left for bottle conditioning. This process is called “Grünschlauchen” in German. 01/17/07: I tasted the beer before but have no tasting notes. The beer was now approximately seven month old. The beer seemed to have a nice head, was clear and had a malty and bitter taste. So it was drinkable as it seemed. This is kind of proof to me that I could store my beers up to seven month without any problems. I guess this is pretty good considering that this was my third brew and I stored my beers at around 15°C (59°F). I still like the flavor impact of Vienna malt. It gives the beer a very malty and rich body. Comparing the Vienna and the Munich malt, the Vienna malt seemed to give the beer a more subtle character than Munich malt. Whenever I want a more subtle malt character I tend to use Vienna, and if I want a more pronounced malt character (like in a Märzen), I would use Munich malt. At that time I just could get the Munich malt 1, today there are two additional Munich malts, 2 and 3 available at my supplier. The difference between all of those Munich malt is their color. I expect that the darker Munich malts tend to increase the malt character and body of the beer as well. Stay tuned for further recipes. I know that my first batches were not that interesting. But I will not proceed posting my recipes in an ascending order of brewing. I’ll just pick one of them and sometimes in the future there will be all my recipes available. The Kombucha scoby(s) are ready to ferment the green tea. Eureka, as already mentioned in the water kefir post, I made my first Kombucha today as well. The recipe was pretty easy: 3 L of hot water (0.8 gal) and 6 tea bags of a common green tea (without any additional flavorings) and steeped for 15 minutes. I then removed the tea bags and added 240 g of white cane sugar, dissolved it and let it cool down to approximately 25°C (77°F). I then added the Kombucha scoby (Symbiotic Colony of Bacteria and Yeast). I added the liquid which came with the scoby as well (which was Kombucha already to lower the pH of the tea). 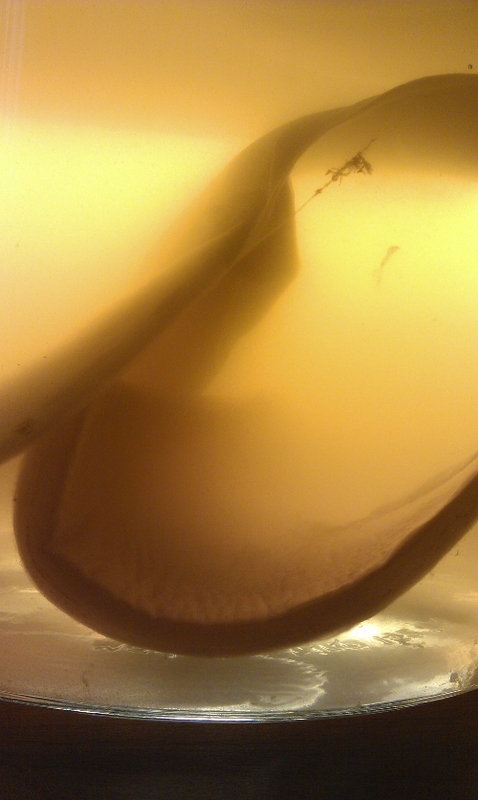 I then saw that I got two scobys… They indeed look very odd and spooky. The scoby(s) have to do their job now and I will decide whether I bottle the Kombucha in 8 – 12 days from now. I’ll update this post with further pictures from the Kombucha as it ferments. The tasting notes will be posted in a different post. Stay tuned. 01/26/12: Kombucha day. First inoculation of a green tea infusion with two scobys. Eureka, the experimenting proceeds. I am planning to do a Berliner Weisse and as it seems that the original Lactobacillus strain seems to be L. brevis for a Weisse. I did some research and found out, that there should be L. brevis in water kefir cultures. So I purchased myself a water kefir culture, and as I was already ordering I bought a Kombucha culture as well, and started my first water kefir today. Will post about my first Kombucha as well. The kefir recipe was pretty simple: two table spoons of sugar, two table spoons of raisins and some lemon juice to 1 L (0.26 gal) of cold tap water and added the water kefir culture. Thats all. I used a big mason jar as a fermentation vessel. The fermentation should take about two days. Since there was not much work involved, I just took some pictures of the culture in the jar. 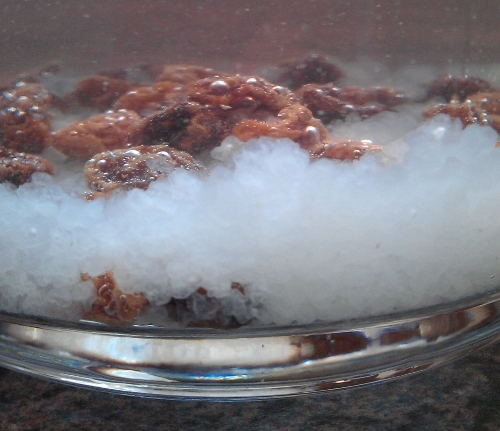 The white stuff are the kefir culture, the brown stuff are the raisins. Really looking forward to tasting the kefir. And of course, I will take some microscopic pictures of the culture in the future. And in my mind is the thought of a beer fermented with a kefir culture as well… Stay tuned. 01/26/2012: Kefir day. Started the fermentation. And the microscopy pictures can be found here.